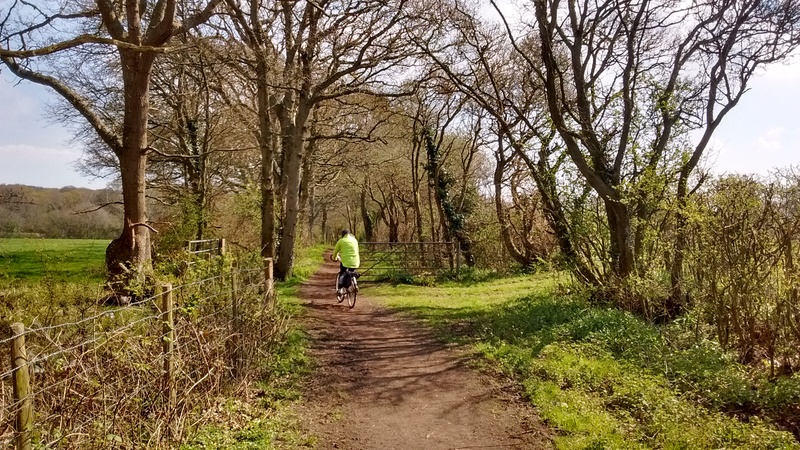 An leisurely ride along the route of an old turnpike through lovely varied Sussex scenery. In places it is possible to imagine how it was 250 years ago. It is normally suitable for most bikes, at least in spring summer and autumn. Suitable for equestrians with absolutely traffic proof horses. 24KM/15miles. About half of the ride is on tarmac. The remainder is generally suitable for all bicycles except those with the thinnest tyres and much of it is intended for cycling and maintained as such. 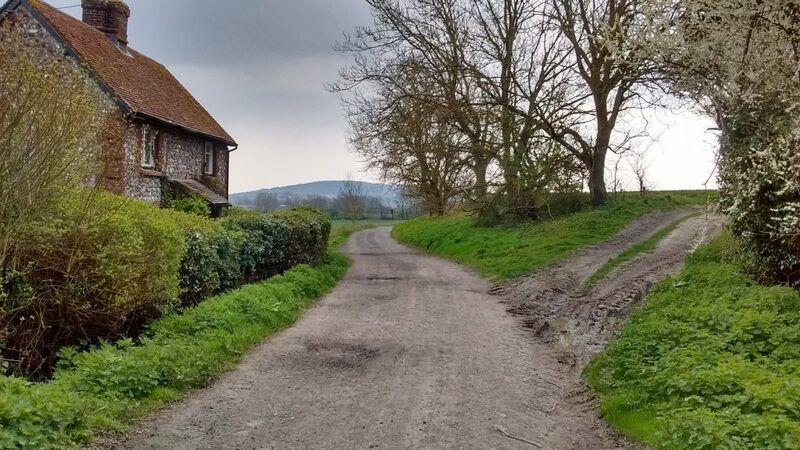 However part of the route, especially just east of Firle is used by farm vehicles and can get a bit potholed. There may be other wet bits, especially in winter. There are a number of short hills in the first half of the ride. Do not be afraid to get off and push if you need to. 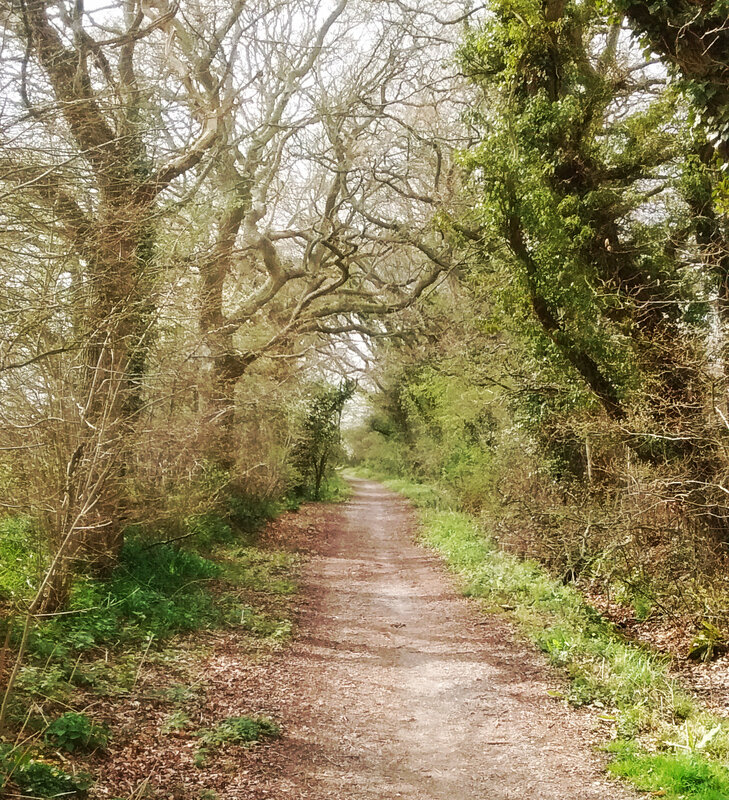 The alternative route between Berwick and Alfriston is only suitable for all terrain bikes. Others may want to divert via Berwick village. Travelling in Sussex at the beginning of the 18th century was a difficult business, with roads often no more than quagmires in winter. But by 1750 Lewes was connected to London by turnpikes. Turnpikes were built and maintained by private trusts, often using existing roads. They would build or improve a road, using a base of large stones topped off by smaller ones set to create a camber which would encourage water to run off into ditches on either side of the road. This sort of road required constant repair. Tarmac was only invented at the end of the 19th century. The trusts were allowed to charge tolls for a set period of years, after which the roads became free public roads. In 1759 a trust was set up to construct a turnpike on existing roads from Lewes to Alfriston. It was called the Glynde bridge turnpike. 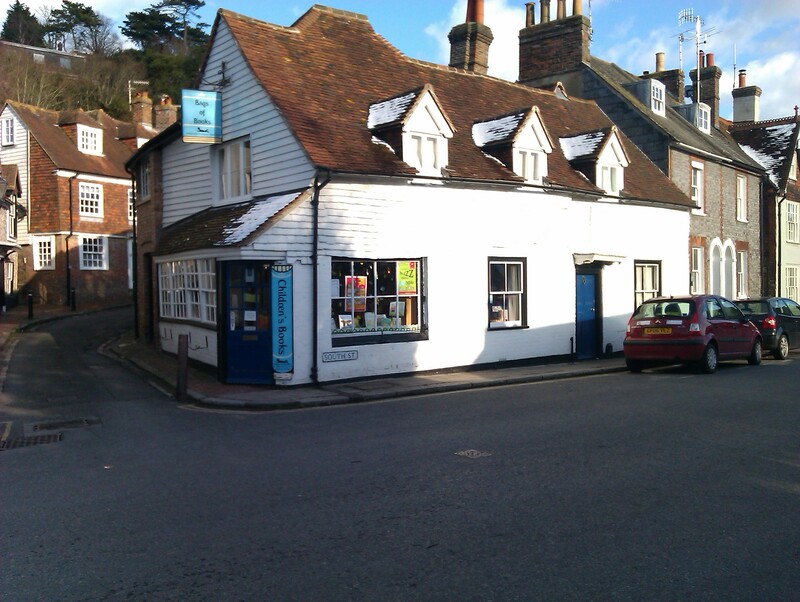 Alfriston was more important then than it is now but even then it was not a particularly popular destination. So there was not much traffic. Worse, there was only one toll gate, at Glynde, so users who did not pass Glynde did not pay. The trust struggled. In 1792 the trust gave up on Alfriston and diverted its route north from a point near Alciston, through Chilverbridge and on to Swines Hill (now in Polegate) to meet the turnpike running south from Hailsham. More toll gates were added. It was not enough. By 1819 the trust was almost bankrupt and a new turnpike was opened, more or less along the line of what is now the A27. Much of the Glynd bridge route was closed off, to stop users of the new route avoiding tolls. But some sections remained and some have come back into use as byways. For more information about turnpikes in this area see “Turnpike Territory by Peter Longstaff-Tyrell, published by the Eastbourne Local History Society. The ride follows the post 1792 route, but there is an option to follow the older route instead. The route starts at Lewes. For the convenience of those coming from out of the area it starts from Lewes railway station. The route finishes at Polegate railway station, which has trains to Lewes. There is an option to cut the route short by stopping at Berwick railway station. Lots and lots- Rural pubs and country tea gardens. Pubs and cafes are shown on the map. The Trevor Arms at Glynde was closed in early 2019 but there were plans to reopen it. All the other refreshment places were open at least seasonally at the time of research, but you should be aware that places do open and close. 1). Leave the station via the exit on platform 1. You are now in the car park. Make for the car park exit opposite and then turn right past the Depot cinema along Pinwell Lane. Ignore a footpath to the right but just before Pinwell Lane joins a main road turn right through a small cut through next to a house outbuilding. You are now in a modern housing estate. Go straight ahead to a junction (about 40 metres). Turn left and follow the road which bears to the left and then reaches a further junction opposite a car park. The horrible stone setts (commonly called cobbles, although a cobble is actually something else) are a piece of fake history. Lewes streets were never previously surfaced with these monstrosities, which are a pain to ride on. You may want to ride on the pavement. Beware of pedestrians. This is a ghastly scheme where pedestrians are encouraged to think that the high street has been pedestrianised, even though it has not. So they often do not look out for you. Turn right at the end of Cliffe High Street into South Street. Ride to the end of South Street and then on to the paved way next to a road that emerges from the Culfail tunnel. Ride along the way to a traffic island by the entrance to an industrial estate. Cross the road at the island and cycle into the industrial estate. At the first junction turn right. Cycle straight ahead past metal bollards and then bear left with the road. The old turnpike started at what was then the end of South Street, although it is not clear where that was then. It then followed the road straight ahead before turning sharp left a little way beyond where you turned. You rejoin the old route after the metal bollards. The road bends sharply right and uphill. You can see the old route heading straight ahead through the travellers’ site, but you must turn right, mount the pavement and then turn left to join the busy A27, following the cycle way at its side. The A27 here follows the route of the old turnpike. The cycle path descends gently to a junction. The A27 goes off to the right and Ranscombe Lane, which is your route, carries straight on. Ranscombe Lane is a very old road. There are records of money being allocated to maintain it in the 16th century. It is on the route of the old turnpike. Notice that the road has been engineered along the side of Malling Down, high enough to avoid winter flooding. Arrive in Glynde. 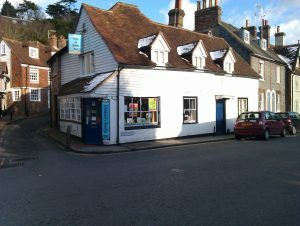 There is a post office and tea room on your right. Turn right here past the playing field on your right and cross Glynde reach and the railway bridge. There was a toll gate more or less where the railway bridge is now. 2). After the railway bridge the road bears right and there is a road junction. Turn left here up a short hill, which is followed by a longer descent to what is now the A27. Turn left on a cycle track. The A27 is built on the route of the old turnpike here. Just before the turning to Firle cross the A27 at a traffic island. Be prepared to wait some time. Turn left at the other side on a path to reach the road to Firle. Turn right along this lane and then pass a road to the left and the gates of Firle Park. Keep straight ahead to the next junction on the left. Turn left here and cycle into Firle Village, past the Ram pub. 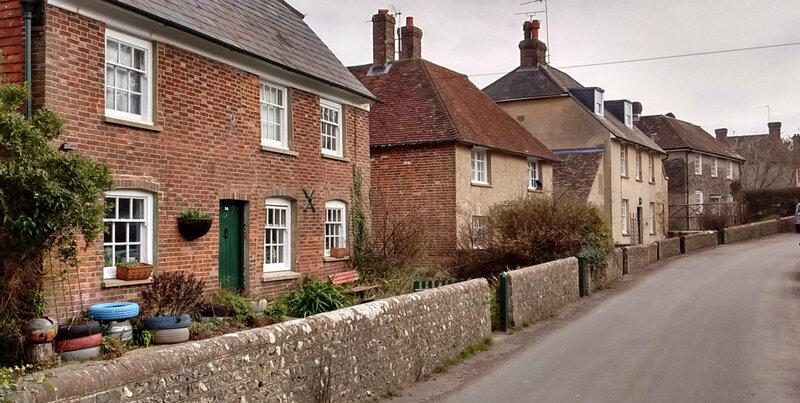 The main road through Firle Village is called “the Street”. It twists and turns a little. Follow it to its end, near the church. The route continues ahead as a track. Follow this track, which curves to the left. You are now on the section of the turnpike popularly known as the Old Coach Road. Although it was resurfaced some years ago with the intention of making it cycle friendly, this first kilometre or so is rough. You are also climbing. Don’t be afraid to walk if you need to. This is usually the most difficult stretch of the ride. The track bears left and you pass a bridleway which goes off to the left. Keep straight ahead. Then pass (or stop at) a summer tea garden. Shortly afterwards bear right to stay on the old coach road. Pass tracks to Charleston Farmhouse (café and Bloomsbury exhibition) and Tilton Farm (once home of Maynard Keynes) and then come to a crossing with a tarmac road by some buildings. This is Bopeep, where the older and newer turnpike routes diverged and where the newer route had a toll house. 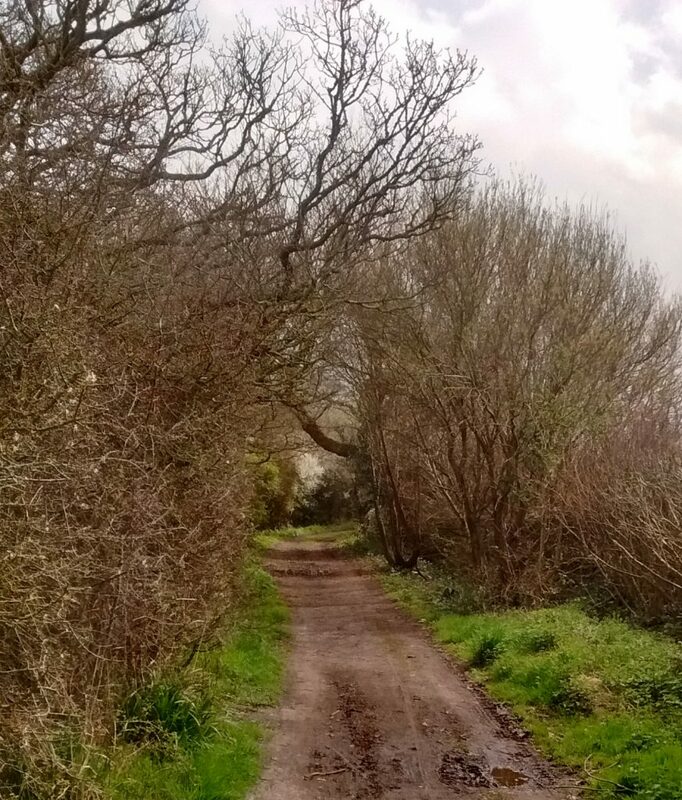 You can follow the old route by going straight ahead until you reach Alfriston, but the section after Berwick can be very rough and muddy. 3). Turn left here on the tarmac road signposted “Selmeston”. Follow the road to a junction with the busy A27. You cross straight ahead here. Be prepared to wait a long time for a gap in the traffic. In the days of the turnpike much of the land you are now passing through was open common. The name of the road you are riding on – Common Lane- commemorates this. The road passes under the railway. There are a couple of bends and then a steady climb, during which you cross the Cuckmere river. At the end of the climb the road goes left (pub in about 400 metres) But the old turnpike goes straight ahead. Continue along it on a track. This next section gives you an idea of what it might have been like to travel the route over 200 years ago, although it was probably wider then than it is now. Come to a junction of tracks. Turn left, passing next to a metal gate. Soon after you turn your route bears round to the right. 4) Come to a junction where a track goes off to the left. The main route continues slightly to the right. It is tarmacked. (If you turn left and then right on a road at the end you come to the Arlington tea garden). The track then reverts to unsurfaced before becoming surfaced again. Keep straight ahead. You are joined by a road coming in from the left. Continue ahead. Come to a junction with a signpost. The old turnpike goes straight ahead here. You can see traces of it on an ordnance survey map, but it is all now private, so you must make a diversion. Turn left up Robin Post Lane, following the signs for national cycle route 2. Initially the road is tarmacked but this becomes unpaved. Shortly after the end of the tarmac come to a four way junction. Turn right following cycle route 2 signs. A stream crossing here may be muddy. Initially there is woodland on either side of you. The scenery changes to fields on the right and woods on the left Keep ahead. This is Nate Wood. 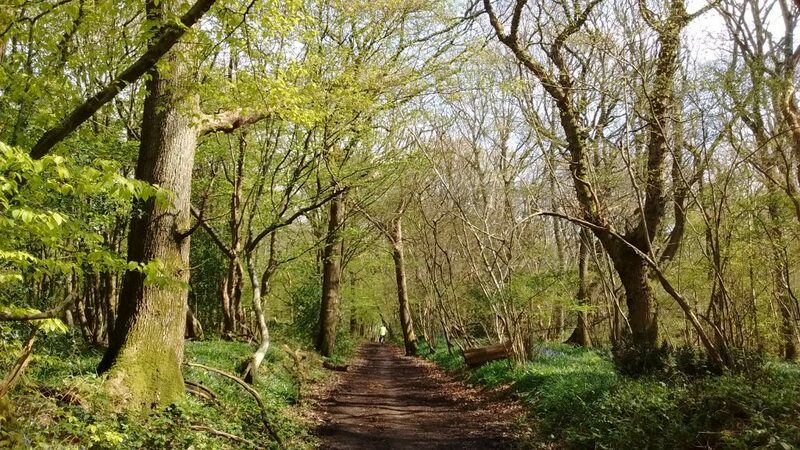 If you enter the wood in bluebell season and explore a bit you will see what is perhaps one of the most spectacular bluebell displays in Sussex. You need to go into the wood on your left and keep going. Ignore a track that goes of to the left. Keep straight ahead on a slightly descending track. At the end of the track you come to the busy A22. The cycle route turns right on a separate route, going under the A22 and then alongside the Polegate bypass. Follow the cycle route 2 signs. You come to one route off to the right leading to bridge over the bypass, but this is only for walkers. Turn right at the next bridge which is signposted as a cycleway. Continue on the cycle route to a junction. Bear slightly right, signposted to Polegate. At the end of the cycle route take the road straight ahead. The road that you have been cycling on is the old turnpike from Hailsham. Somewhere around the junction with Victoria Road was the junction between this turnpike and the old Glyndebridge turnpike. The Glyndebridge turnpike ended here and had a toll gate. There is no trace of anything today though. Turn left down Victoria Road. At its end turn right to reach Polegate station, where trains to Lewes are available.